It’s been a long time coming, but the band’s 25th anniversary campaign is officially underway! 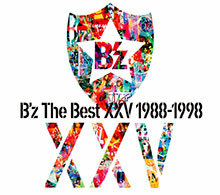 Their latest compilations, B’z The Best XXV 1988-1998 and B’z The Best XXV 1999-2012, are finally on store shelves and offer unprecedented value! And, as always, you can check out translations for all other 50 songs included on the Lyrics & Translations page on the B’z Wiki! B’z have a very busy summer ahead with stops all over Japan for B’z LIVE-GYM Pleasure 2013 -ENDLESS SUMMER-, but you can be part of the hype right now by checking out the collections below! Both are available worldwide on CDJapan and YesAsia! I love these sets! My only complaint whatsoever is that BAD COMMUNICATION isn’t included. I know that’s because it was a mini album and not a single, but still! It was the song that kept them from throwing in the towel! You are right in a way. It is a single collection. BAD COMMUNICATION wasn’t a single, so it doesn’t appear on that set. BUT the 4 new songs aren’t singles either! It’s a shame to have the superb song HOME followed by the unique bad (not saying horrible) B’z song HEAT (because HEAT is really a bad song). Q&A, Kakushin and particularly Utopia are good songs. I’m now looking forward to their 51st single! Maybe in the end of 2013 or in 2014? They included the 4 new songs simply because: they have to, otherwise no one, especially their fans, would want to buy another best albumn from B’z. Seeing that they’ve already released too many best albumn during last 10 years, honestly speaking, most of their Japanese fans are very, very dissapointed about this decision. However, I myself do think the Best XXV is meaningful for B’z, it makes me realize again that how long a journey they’ve gone through. So, I think I can make peace with it. I don’t know many fans that are “very, very” disappointed about it, especially considering it contains not only the full versions of these old videos that we’ve been asking for forever (which were previously scattered about the internet in random VHS transfers at 140p in MPEG format with an FPS of about 12), but two new ones in addition to the four brand new songs. For me, I’m also very happy to see Dakara Sono Te wo Hanashite, Kimi no Naka de Odoritai, and LADY-GO-ROUND back where they belong with the rest of the B’z singles. Thanks to the label troubles, this is the first time they’ve been collected on an official B’z compilation, and it’s only suitable that they be found with the rest of the singles as they were an important launching point for the band as well. 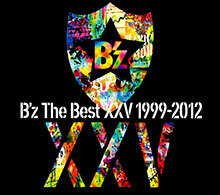 B’z has been working constantly for 25 years, so some decreasing quality is to be expected. This happens to every musician in the world, do you think it’s easy mantaining the same quality for 25 years? In fact, despite Mr Children selling better than B’z, they’re last two album Sense and Imitation hasn’t been that well received either. Hell, their amazon rating is lesser than Magic or C’mon. To be honest B’z really need to take a break or at least spend more time making an album in the studio so it can be perfect. Looking how amazing David Bowie’s The Next Day(which was created after 13 years hiatus) quality wise and chart performance wise, a break won’t be band for B’z. They also need to release a live album to be honest, their live energy is just not something that can be capture in the studio. BTW, big artist such as B’z usually have an unpleasable fanbase anyways, I couldn’t care less about them. Forgot to add, in the 25 years of their career, B’z is more productive than many japanese artist I know, especially during their peak year. Seriously, compare how many albums and singles B’z release in the 90’s to artist such as Mr.Children or Southern All Stars. It’s a rule that people who are unhappy are much more likely to express their discontent than people are perfectly OK with it (namely, because they have other things to do). People who are displeased are far more likely to voice their displeasure. You really can’t put any stock in the opinions of such an aimless, formless group, and definitely cannot let them shape how you think as well. As far as history goes: Plenty of people were skeptical about “SURVIVE” too, because it was such a departure from “LOOSE” (which was also met with skepticism when it came after a double album with a completely different theme, and then went on to become their best-selling studio album ever). “GREEN” was completely different from “ELEVEN”, people wondered about “ACTION” because it was a lot different from “MONSTER”, etc etc etc. There are plenty that really, really disliked the idea of “OCEAN” too, because it was such a “soft ballad” compared to “Ai no Bakudan” being such a high-energy, live-ready rock song. The truth is that people simply expect those on top to fall off eventually, and “the next thing” is always going to be given that sort of expectation as a result. The next sequel for a big movie, or the next season for a TV series–that will always be the one where things crash and burn. The reason this hasn’t happened to B’z is that they -don’t- just release anything that they have for the money (unlike with movies, TV shows, and other big bands), and have more dead stock of work they were unhappy with than most bands do in their entire discography. B’z simply will not release something if they are unhappy with it, and that’s why there is very rarely anything even resembling anything remotely “not good” when it comes to their work. As is evidenced in your post with those you mentioned and what’s added here, people who complain and have doubts tend to be wrong most often. People who complain on BBS systems and 2ch are usually just venting and/or trolling when even the smallest thing isn’t to their liking. If they had any sense of what the band was about or their history, they would realize that at least one compilation album was coming this year no matter what. There’s still time for a studio album to come at the end of the year/early next year for another tour in 2014–these releases and this tour do not prevent B’z from making new music (in fact, plenty of the best songs by the band were written -and- recorded during tours). In short, there are people who will complain about everything. If you make “another rock song”, there are people who want a ballad. If you make a ballad, there are people who want more rock songs. What’s important is just finding what we enjoy and supporting that regardless of what other people think instead of indulging in endless negativity that spirals into more and more error-laden discontent. I agree with Bad Communication. It wasn’t a single but… it’s such a huge part of B’z’ success that the fact it’s not on such compilation, it almost feels empty without it. I’d gladly switch Heat for Bad Communication any day. All of the promotional videos have been remastered to the best possible video fidelity with current technology. Keep in mind that B’z was a very obscure band when they began, which is why some of the early works were filmed on video instead of film (since it was much more affordable for an up-and-coming artist). Also don’t forget that this spans a period of twenty-five years. We’ve gone through so many technological innovations on the video front alone that it’s unreasonable to expect the videos to all be widescreen or anything like that. Some of the videos were shot in 4:3, some were shot in 16:9, some were shot at cinemascope; some were shot on video, some were shot on film, some were shot on digital. As someone who has worked tirelessly in this field for over eight years: Trust me, they’ve done an excellent, excellent, excellent job at preserving and presenting these works and have done it in the only way feasible. As for why some use unreleased LIVE-GYM footage: Some singles simply didn’t have music videos at the time of their original releases, so giving us live footage (especially previously unseen live footage) is a great trade-off if you ask me (especially for songs like “ALONE” which are not performed live especially often). They could have just released nothing, which I think no one would’ve been happy with. B’z are always good at finding a happy medium. Right now, there’s not really a means of releasing a full past LIVE-GYM on its own. There’s just not really a market for that currently, but there will be one day. B’z have filmed basically every tour they’ve embarked upon, and they’ve been very keen about not saturating the market and exhausting their back catalogue at every turn (unlike virtually every other artist who have way more live videos than you’d ever want to watch). One day, when they’re retired, the archives will start to seep out, but for now, letting them release what they think is best when it comes to those 20+ year old performances seems fine to me. The problem IS – 1) Even PV’s from 2000’s are small sized ( (at the same time TM’s and KI’s officially released PV’s were all normal sized). And those lives (93, 95) were released on DVD in a good quality, why did they cut them? 2) Many of those PV’s you can fin on youtube full-sized and in a quite a good quality often as a part of some music programms (something like “request…”. don’t remember the exact names. So that means those shows have full-sized PV’s in a good qulity. I didn’t understand what was the big idea to make a mix from norman sized and small-sized PV’s even with modern ones from 2000’s? I know that B’z always makes products of high quality but I’m disappointed after good official releases of Matsumoto’s and Inaba’s PVs. If those were normal size XXV would be good releases as well. OK, so, the short version. I’m not sure why you would find the videos to be overly small, unless you are watching these videos on a 4:3 TV. The consensus in the video community is that 16:9 should be prioritized because A) widescreen is the future and B) most people have widescreen TVs now. 4:3 videos look good in 16:9 frames, while 16:9 videos in 4:3 frames do not adjust as well, because the width is simply not enough to give you a sharp enough picture with the height space you’re given. Now, in 2013, releasing 4:3 DVDs just doesn’t make much sense anymore, because the vast majority of the people watching will be doing so on widescreen TVs, and the 4:3 image will simply be stretched for everything (even the 16:9 videos) on a lot of setups for less tech-savvy people. In short: These DVDs are meant to be watched in widescreen. I had a much longer post about it, but it looks like that’s been lost now. Hopefully this covers it still. I’m not sure what sort of setup you’re using, but on everything I’ve seen the videos on, they look fine (both the 4:3 and 16:9 ones). These are the definitive and highest quality versions of any of the PVs prior to 2005, that’s for certain. No YouTube rip can compare with these transfers from the originals. I’m actually a little bit disappointed that they’ve released a live version of Easy Come Easy Go instead of PV. It’s also one of my favorites PVs. But if this decision was done due to a possible damage of a video I can understand. But if so it makes me sad about the video itself. My assumption regarding this is because FILM RISKY is its own, standalone product that they may want to reissue in the future. It’s never been released on DVD before, so it’s possible they will, at some point, remaster it. You are right, it’s true that one shouldn’t make judgement from the comments on internet. I admit that I was very uncomfortable, even a little bit hurt, to read those harsh comments from their own fans(at least as they claimed); and it caused my concern about whether it would affect their future career. As is known to all, B’z has been very productive during its career, and we also know that the Japanese artists are all workaholics, often they felt a duty to be active; if you want to keep your popularity, you can’t stop. I rememer Inaba and Tak once had some kind of comment about this situation, in recent “Be With”, I think? As a result, when they slowed down suddenly, the fans become uneasy and dubious-partly because they eager to hear new songs from B’z, which I can understand. However, I still think that the dissatisfaction does exist among some fans, they hope B’z can be perfect and energetic as in their 30s, for ever. I don’t think it would be a good idea to push them too hard if they feel tired or need a rest. Considering they are around their 50s, they should be given right to take their time to garantee a good quality. I really hope more fans can spare more patience and understanding, not just complain about everything. Actually, I’m very glad to know your opinions, thank you to you all. Like I said before, big artist such as B’z usually have an unpleasable fanbase. This kind of fanbase exist in every form of media from film to video games. The bigger you are the more expectation the fans have and the more hater exist. There’s always going to be jackasses with negative comments until the end of time, even The Beatles have many “fans” like that. There are many positive comments for B’z too, their facebook account is full of them. Seriously, if every time some fans goes frothing at the mouth for something and they have to be paid to attention to, it will take all off the the artist’ time, time that can be instead use to create a product for the artist. Remember how after Thriller, people always MIchael Jackson’s expectation for his next albums were off the chart? Bad and Dangerous sold well, but not as well as Thriller, eve then, if not for all the controversy he would still be one, if not the biggest music artist in the world. Rather than pandering to the fanbase, they should just try to make the best music possible. Popularity, is cyclical anyway, sometimes you’re up, sometimes you’re down. Aerosmith, Van Halen, Black Sabbath, they all experience highs and lows in their career. B’z have been in a very constant high in the 90’s, it’s to be expected for them to be lower now. Just because there’s some guys with their computer bitching about everything isn’t gonna make B’z any less popular. People complains all the time and they will always do so, such is human nature. I could hardly care if some fans gave negative response using pretty much what amount to throwing a tantrum. I could never get disheartened by their comments, piss off maybe. For me, they are just nobodies trying to brighten their life by mocking people who have made more achievement and successes than they are. They’re like children whose mommy won’t buy them the right action figure or the right ice cream flavor. At least if the criticism is intelligent and constructive, it’s fine, a lot of time though? Not so much.